Did you know that the CT Youth Drill Team placed 3rd in the Northeast Youth Drill Competition? 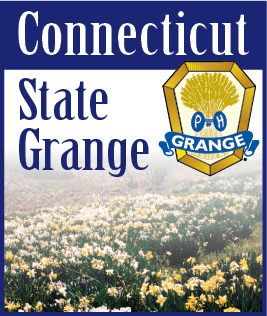 Did you know Wolcott Grange held a VERY successful event at the New Britain Rock Cats game and were able to talk about the Grange from the field between the double header games? Did you know we have a few extremely musically talented Junior members? Did you know there were around 100 members and future members that enjoyed a picture perfect summer day at the CT/RI Annual Grange Picnic? Did you know Ekonk Community Grange recognized several members for over 775 years collective service and continual membership to this organization? Did you know there is a group that is in the process of coordinating the potential reorganization of Groton Grange? Did you know there are some 10 people taking Code Reading classes, and to date 3 have tested positive for Code Reading? Did you know Cannon Grange received a major award from the US EPA? Did you know the Master, Overseer, Lecturer, Steward, Assistant Steward, Lady Assistant Steward and Gatekeeper elect of one of our Granges are all under the age of 20? Did you know the leadership of the Director and Staff of your Camp are doing an amazing job running Camp Berger? This is just a very tiny sampling of the amazing and positive events and efforts of the members of this State Grange. This list, if I had all of the details, would fill this paper. Why doesn’t it? Why are we keeping this information so tight lipped? Why are we continually reading articles nationwide about the diminishing membership numbers and the loss of yet another Grange? Why is it so easy for us to talk about these items and not CELEBRATE the POSITIVE? I will not kid anyone, if we do not change our outlook and stop dwelling on the past and the negative, we WILL perish as an organization. I don’t know about you, but I and my family (I am at least a 3rd generation Granger) have all put too much into this organization for us to let it go away. The aforementioned in this paragraph is a real and scary possibility; it is NOT our true future. Our true future is bright, it is exciting. It is one of Growth in membership, in the number of Granges, in well educated members and in GREAT Leaders at all levels. Our true future holds endless possibilities and opportunities for all members and communities. How do we move from our current state to the true future state? Stop! Stop focusing on those things that we cannot change, stop putting effort into negative energy. Instead, forge a path of growth and prosperity for your Grange, your members and yourself. Learn from our short comings. Be positive. A positive attitude is contagious. Everyone wants to be part of something that is meaningful and progressive. Embrace others ideas with the curiosity of a young child learning something new. Support your Brothers and Sisters through good times and hard times, after all we are FAMILY, and above all else, CELEBRATE THE POSITIVE.